The events of our time show that too many people have graduated high school in the last twenty years without understanding our history. Ensure your students learn basic history by using Boundary Stone textbooks. These textbooks are perfect for Christian high schools, home schools, and even colleges. Historian Clarence Carson was a Vanderbilt educated PhD who capped his career by writing this series of textbooks. Dr. Carson was a mentor to economist Dr. Paul Cleveland. A few years after Dr. Carson’s passing in 2003, Dr. Cleveland began to reformat these books to bring them to another generation. Recently he finished the update of Basic Economics. An accompanying online course and teacher’s guide are also available. 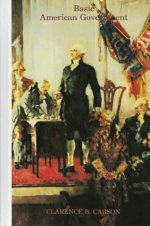 A Basic History of the United States is a six volume paperback set containing over 1500 pages covering the history of our country from the European background to 2001. It has been widely acclaimed by reviewers, readers, teachers, home schoolers. Year 1 uses volumes 1–3 and Year 2 uses volumes 4–6. Understanding the Modern Culture Wars should be combined with primary source readings and the final nine weeks of the year could cover chapters 3-6 or 7 of Basic American Government to lay the historical foundations for the study of government and economics next year. Basic American Government and Basic Economics can be used to cover the subjects in one year. The two books go hand in hand. One semester of government and one semester of economics. Books by Dr. Paul Cleveland related to how economics affects public policy. Our main job of educating our children should be to teach history from a Christian world view. Dr. Paul Cleveland does an excellent job of presenting history in a truthful way. Great resources for you and your family.